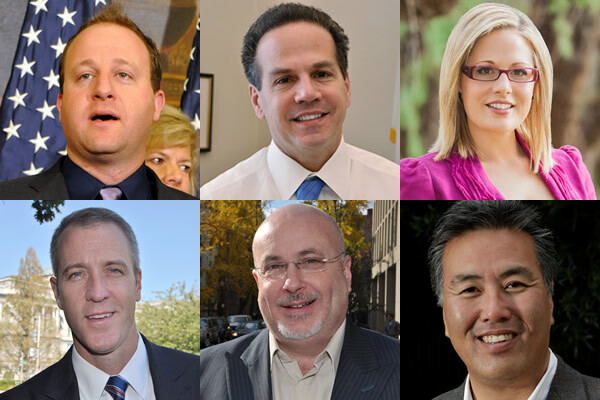 (clockwise from top left) Jared Polis (D-Colo.), David Cicilline (D-R.I.), Kyrsten Sinema (D-Ariz.), Mark Takano (D-Calif.), Mark Pocan (D-Wisc. ), and Sean Patrick Maloney (D-N.Y.). (Photos of Polis, Cicilline, Maloney and Pocan by Michael Key for the Washington Blade. Photos of Sinema and Takano courtesy of the respective campaigns). A record number of lesbian, gay and bisexual candidates were elected to the U.S. House this year, nearly doubling the number of out representatives serving in the lower chamber of Congress. Gay Reps. Jared Polis (D-Colo.) and David Cicilline (D-R.I.) won re-election, and on the same night, out candidates Sean Patrick Maloney of New York, Kyrsten Sinema of Arizona, Mark Takano of California and Mark Pocan of Wisconsin won their races. The new additions — minus Rep. Barney Frank (D-Mass.) and Tammy Baldwin (D-Wis.), who are leaving the U.S. House — means LGB representation in the chamber will jump from four lawmakers to seven. Maloney, who will be the first openly gay U.S. House member from New York, said upon the announcement that he won his bid to unseat Rep. Nan Hayworth (R-N.Y.) that voters in the state’s 18th congressional district voted for change. Sinema will become the first openly bisexual member of Congress and Takano will become the first openly gay person of color to have a House seat. Pocan’s election means Wisconsin’s 2nd congressional district will maintain gay representation as Baldwin heads to the U.S. Senate.